This year the NY Sheep and Wool Festival in Rhinebeck NY was held over the weekend of October 20 and 21. I spent most of that weekend at "The Knitting Garage at A.L. Stickles". As early as Wednesday knitters and other fiber artists started arriving in our small town of Rhinebeck and we were happy to welcome them at "The Knitting Garage" with snacks for both body and soul: Julie had baked yummy brownies and lemon squares and wound some yarn cards as samples to be taken along and tried out at leisure. Some yarns could also be sampled by knitting a few rows right then and there. It was awesome to meet so many knitters and some of them famous ones to boot: The knitgirllls Leslie and Laura stopped at the store and were impressed by the variety of yarns we carry. Just watch their blog; the store is mentioned twice in episode 129 (click on the link to see). I was just told the following: " I am still having fond memories of our visit to the shop. 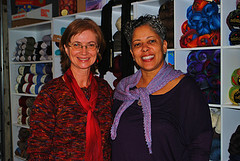 Hey I also heard the shop was mentioned on The “Girlfriends Knitting Podcast” (click on this link yo view the podcast).. It seems it was the most popular place to stop after Rhinebeck. Steven West was also there at the Knitting Garage and told us about it. I am casting on my “howlcat” as soon as I finish this simple pleasures hat I started." Doris it was such a pleasure to meet you. You were most helpful to us on our visit. I am so glad that we stopped by. This is the a cozy and well stocked store with really quality yarns. I am adding it to my list of "Must See" places when we come back next year. It was so nice meeting you! We had a great time! Fun to see about the many visitors to the Knitting Garage during the Sheep & Wool Festival. A must visit for me next year!! !